Summer’s officially here, and if the Shavuot heat wave didn’t signal the end of my time slaving over a hot stove, then I’m not sure what will. For summer dinners, I need fast food–and I don’t mean the kind from the drive-thru. Dinners shouldn’t take more than a few minutes, and definitely shouldn’t require the oven. That makes stir-fry veggies perfect for dinner. 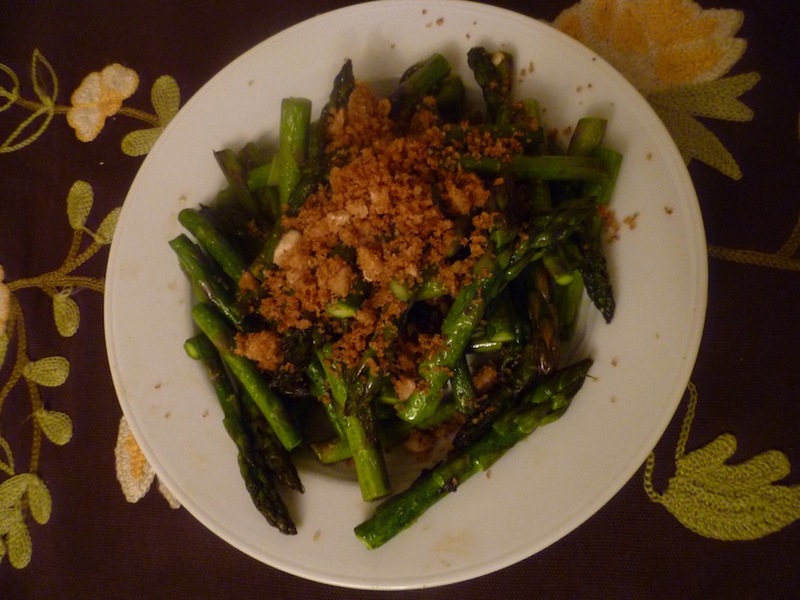 Top asparagus with homemade sauteed breadcrumbs and watch my kids lick the plate. Steam the asparagus in a steamer or, if you don’t have one, boil a half cup of water in a wide, covered pan and add the asparagus. Steam for only a few minutes so they stay bright green. Shock the asparagus by dumping them in ice water. Strain and add butter, vinegar and salt. Top with breadcrumbs. Process 3-4 pieces of old challah in the food processor. Saute 3 heads of minced garlic in olive oil. Once light brown, add the breadcrumbs. Saute until lightly browned. Serve on top of vegetable dishes or store to use within two days.